We are all about the manias here at Casa del Aguas. When we get interested in something be it painting, woodworking, modelbuilding or cooking we go all out. For the last couple of months I've been obsessed with vegan cooking. I've been a vegetarian for a long time so I never worried too much about my cholesterol or anything like that. But I guess my love of cheese and pasta caught up with me because at my last checkup the doc told me I need to lower my numbers or I'd have to start taking meds. I'm rubbish at taking pills so I decided to try to clean up my diet big time. I have to go back in December for another blood test but so far I've lost 21 pounds by eating lots of veggies. My new Staub grill pan works a treat on peppers and mushrooms. It's great for asparagus too. I finally found a Crockpot that works, only twelve bucks at Target. One of the challenges of being a herbivore is that by the time I cooked everyone's carnivore food I was left with a microwaved potato. So now I set this up in the morning, so by suppertime I have something delicious too. I've also started prepping a lot of food for the week on Sundays. This is a broccoli, bean and corn salad that will keep all week. So easy, just blanch the greens and add a can of beans and some frozen corn. Dress the salad in lime juice, balsamic and a bit of maple syrup. Nummers! It helps to have sharp knives. Here's yesterday's haul from Grower's Ranch, a local family market. http://growersranch.com/home.htm Baked sweet potato fries are great! This morning I made these banana, berry, oat breakfast bars. I'm not going to lie, they're no fudge brownie, but for a quick breakfast in the morning, they are perfect. My favorite breakfast is an almond milk smoothie with spinach and ginger. I keep the freezer stocked with Ziplock bags of frozen bananas, berries and mangoes. Crockpot veggie chili... warm and satisfying. I also prep for the week by roasting a few taters. I recommend these small waxy ones. The last couple of sourdough loaves that I baked came out like hockey pucks. I was saved from bread baking despair by an actual phone call from Australia from my mate, Celia, aka the Bread Whisperer. It was so good to hear her voice. 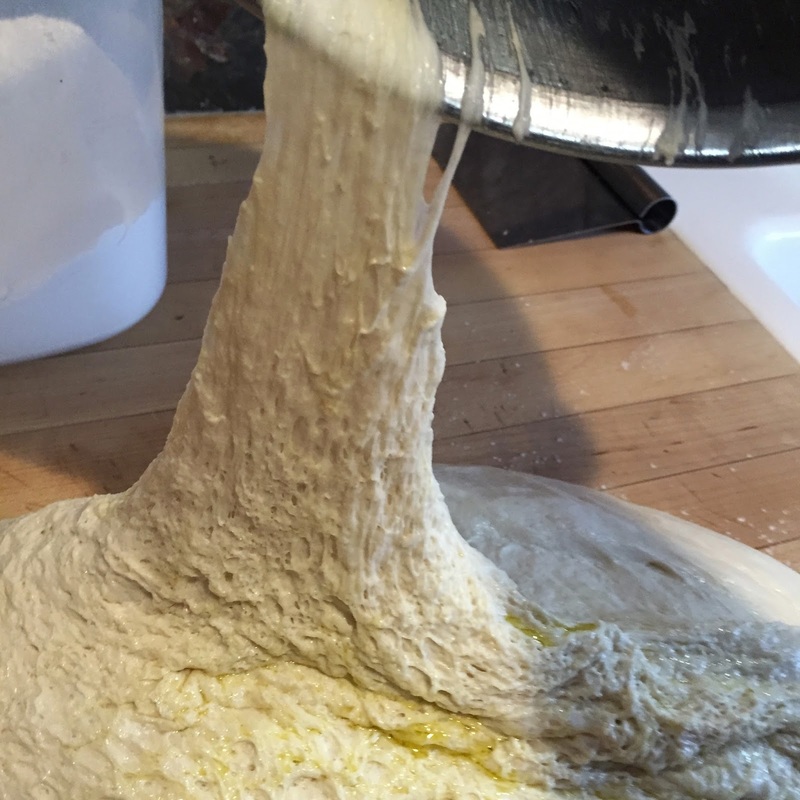 She figured out that the humidity here in California was making the dough too moist. I increased the amount of flour and I was back in business! The loaf on the left is from before, the one on the right was after. 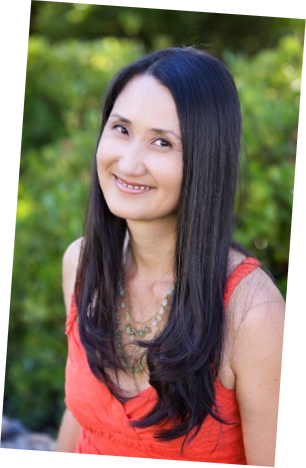 If you aren't following Celia's amazing blog, Fig Jam and Lime Cordial, then you should. It is the tastiest, loveliest place on the internet. So that's what I've been up to... what's in your kitchen? "Happiness, not in another place but in this place...not for another hour but for this hour." ~ Walt Whitman. Some time ago, maybe seventeen years or so, I took an art class where every week a different model would pose and we furiously painted portraits in oils. I then hid the paintings in the garage and promptly forgot about them. The teacher painted in a photorealistic style and described my paintings as "decorative", which was pretty derogatory at the time. After a couple of months I realized that I didn't really like painting portraits that much and quit. But looking at these made me feel like perhaps I might like to paint people again. It also made me realize that it is okay to experiment and fail, as long as you get back to it and keep trying. This model worked at Medieval Times and had long hair. The words around the edges are from a poem by John Donne, "At The Earth's Imagined Corners" and talks about angels blowing their trumpets to raise souls from death. This last month was busy with birthdays and Mother's Day. Victoria Sponge Cake with Chocolate Ganache frosting for Mother's Day. I had never made a ganache frosting before and it was surprisingly easy. I used very dark 80% chocolate and it bordered on bitter. Next time I'll be a bit more generous with the sugar. The fresh strawberries made it juicy and sweet. I love broccoli and picked up a bunch of broccolini from the farmer's market. I used it in a stir fry with seitan, bell peppers and sesame seeds. Also for Mother's Day I made a tropical fruit salad with apples, oranges, raspberries and strips of mango. 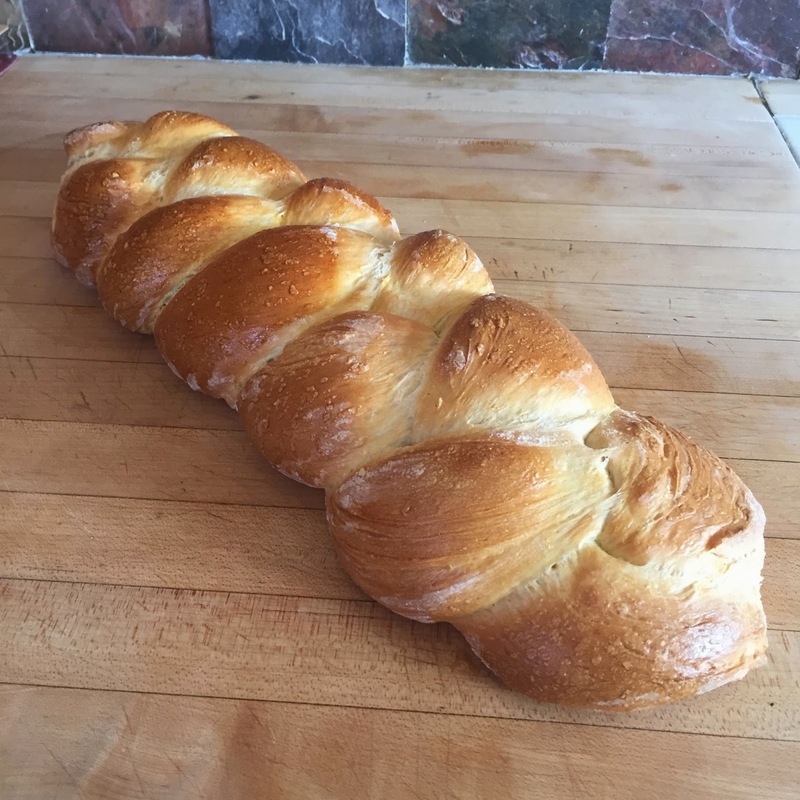 I finished my "Twenty Hour Challenge" of bread baking. I learned a lot. I like the routine of it, and there is something to be about a process that billions of cooks have done for centuries. I'm not sure what my next kitchen challenge will be. For my birthday my hub bought me a glorious Le Creuset sauce pan. For it's maiden voyage I made a Bearnaise sauce. Mostly I've been using it to flash boil veg. It's just the right size for peas, green beans or broccoli. The rest of Mother's Day was pretty quiet so I made some pasta. I don't make pasta from scratch very often but I bought a bag of good semolina flour and thought I'd try it out. Finally, I've been posting a dragon's hoard of jewelry in my Etsy shop, lots of shiny happy things. What's been happening in your kitchen? Don't be afraid to attempt something new. Remember, it was amateurs who built the ark. It was professionals who built the Titanic. 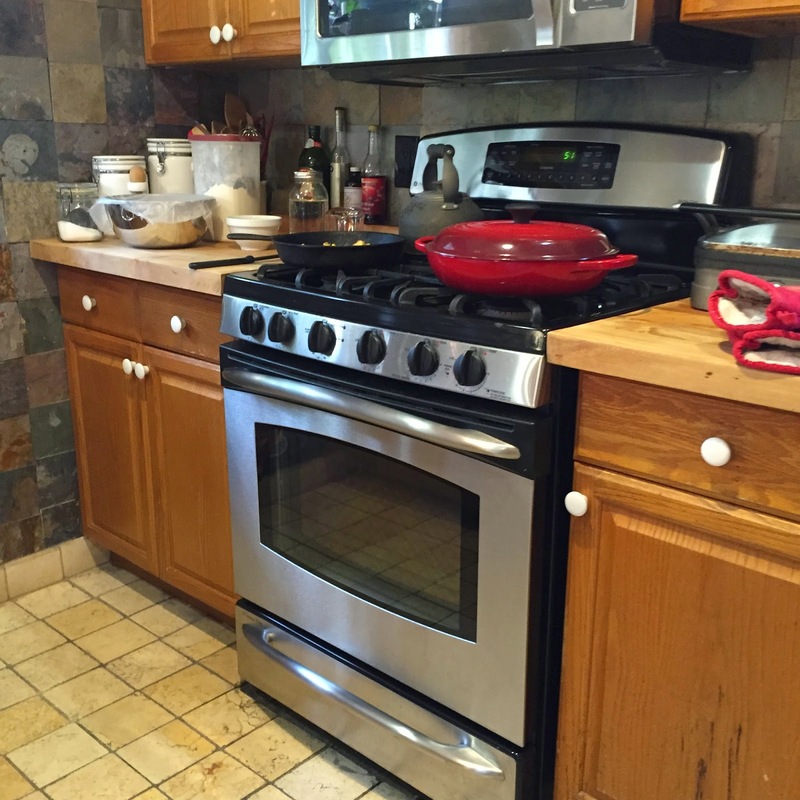 When we first bought our house two dozen years ago, I hated the kitchen. 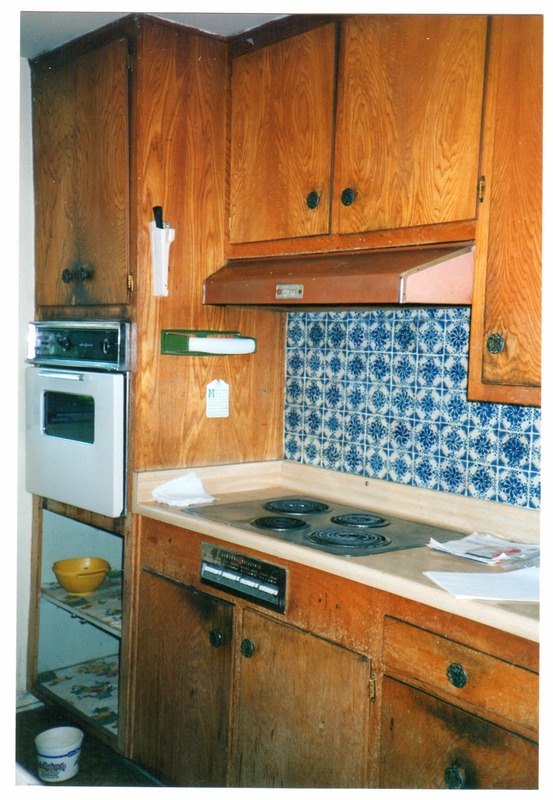 The whole house was a fixer upper from hell, with orange wall paper, green linoleum and iffy plumbing. Nothing worked, the fuses blew if you even thought about running more than one appliance at a time and it was cramped as a submarine. Over the years, the hub has replaced ever bit of it, even the fuses, so I can run the microwave and the dishwasher at the same time.... and now I love our little kitchen. We still have to walk sideways like crabs when we are all in there, and yell, "Hot behind you! "when we open the oven, but it works. I'm still in the middle of breadbaking mania. After watching a TED talk on how to learn a skill in 20 hours, https://www.youtube.com/watch?v=5MgBikgcWnY, I decided to bake 20 loaves of bread, trying to make each one a little bit better each time. The goal is a crispy crunchy crust and a chewy airy crumb. One loaf I made had a nice mix of seeds and grain. Some loaves were prettier than others. I baked #13 yesterday and it came out just fine. 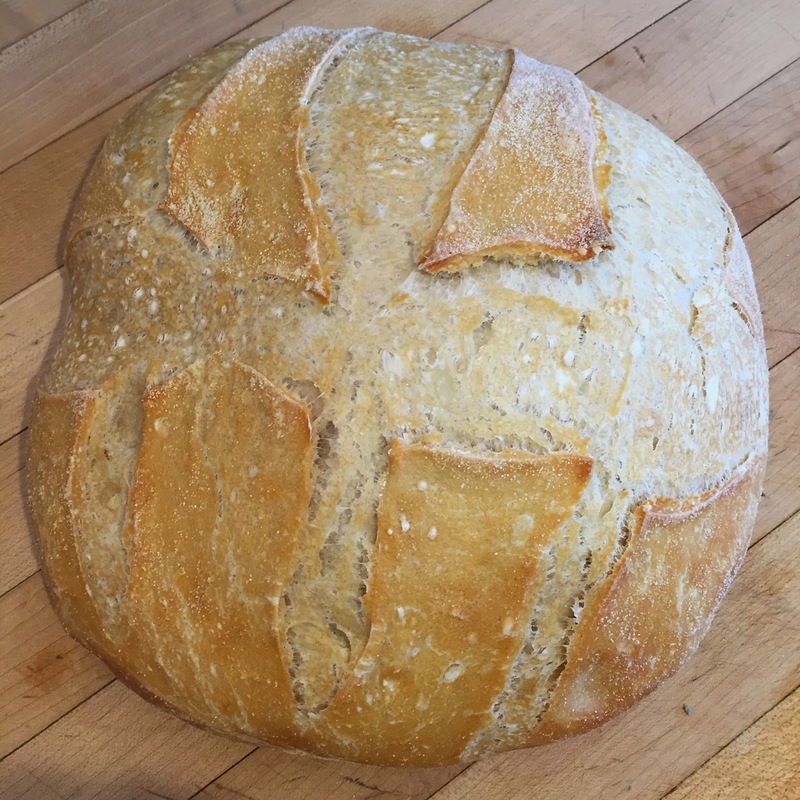 Each loaf is exciting in a small, humble way. I like finding out what happens if the recipe is tweaked a little. It's teaching me patience. The baked loaf has to sit for at least 20 minutes before you cut it or it will be gummy. Bread baking is teaching me planning, a loaf for Friday needs a starter feed on Monday, sponge making on Thursday and shaping and baking on Friday morning. It's helped to have my mate, Celia, bread baker extraordinaire from Fig Jam and Lime Cordial, patting my hand and giving me good advice along the way. 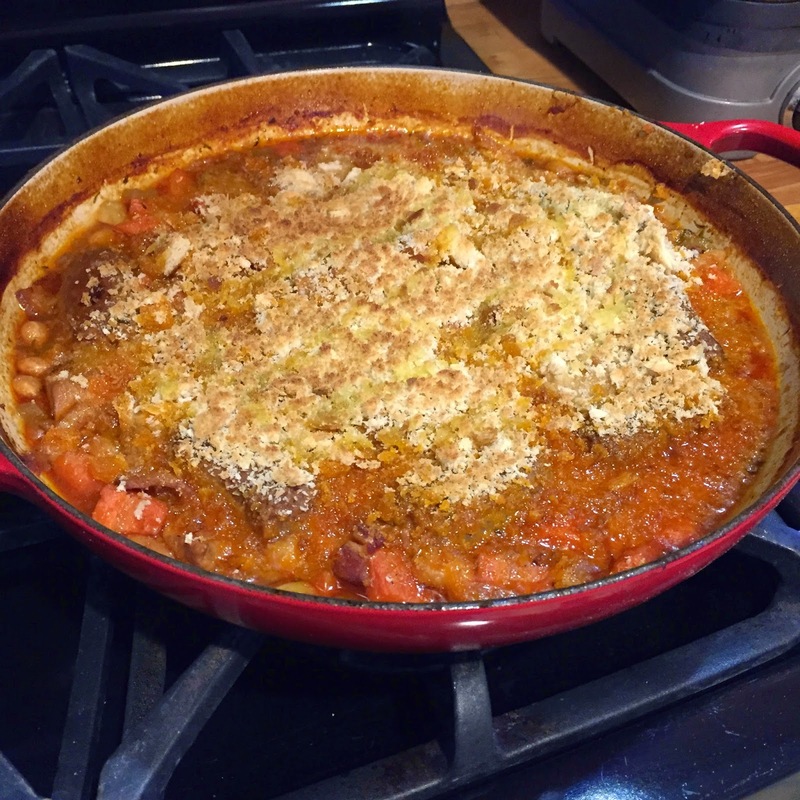 I've been getting a lot of good use out of my Le Creuset red brassier, I made a cassoulet for the first time. 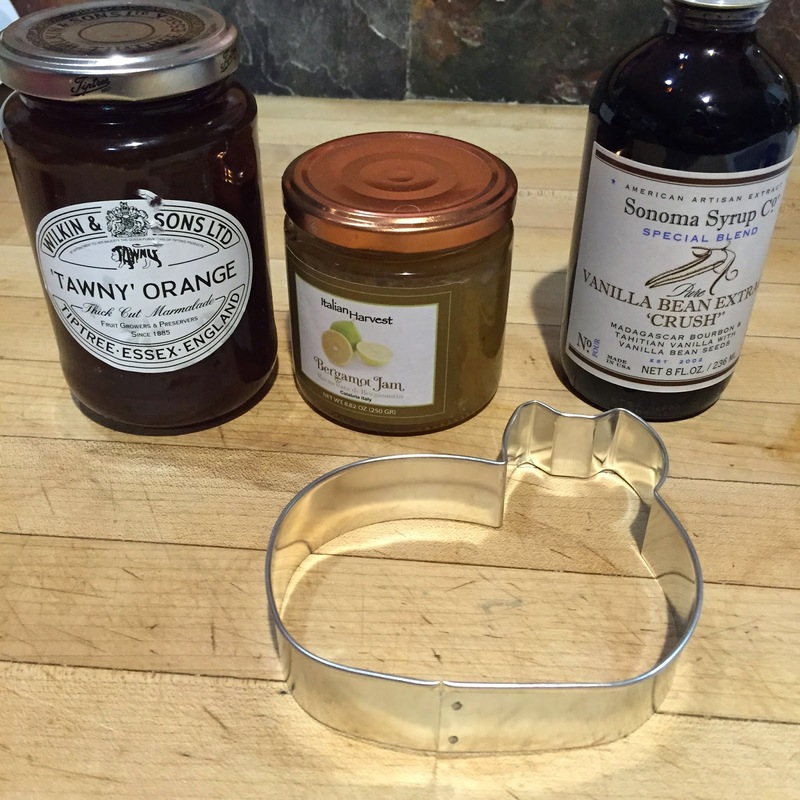 For Valentines, my man got me Orange Marmalade, Bergamot Jam, vanilla and a cool kitty cookie cutter. 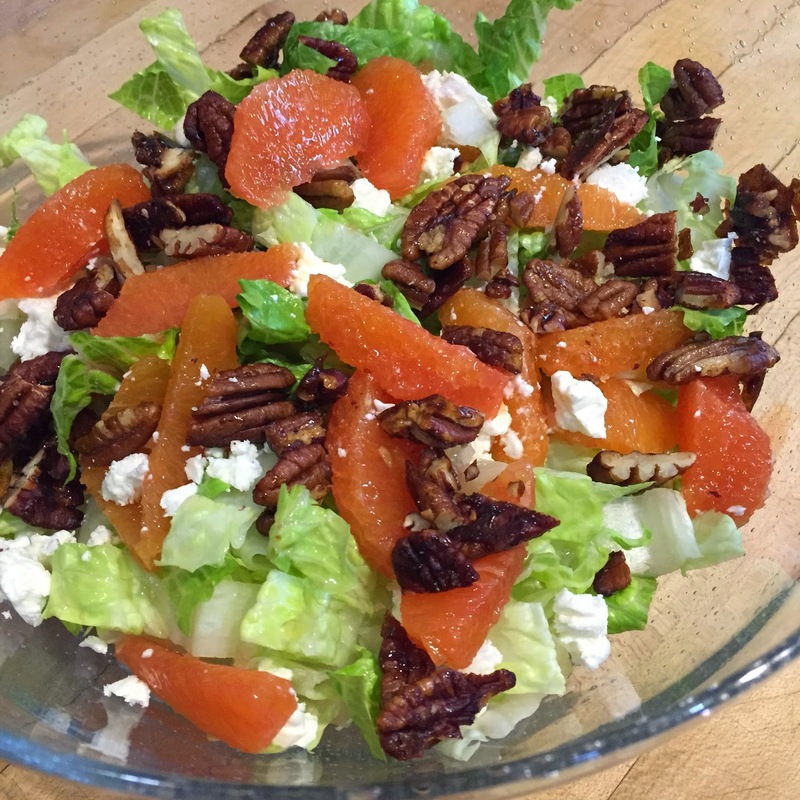 The Farmer's Market had these beautiful red oranges, so I made a salad with feta and spiced pecans. So, that's what's in my little kitchen. 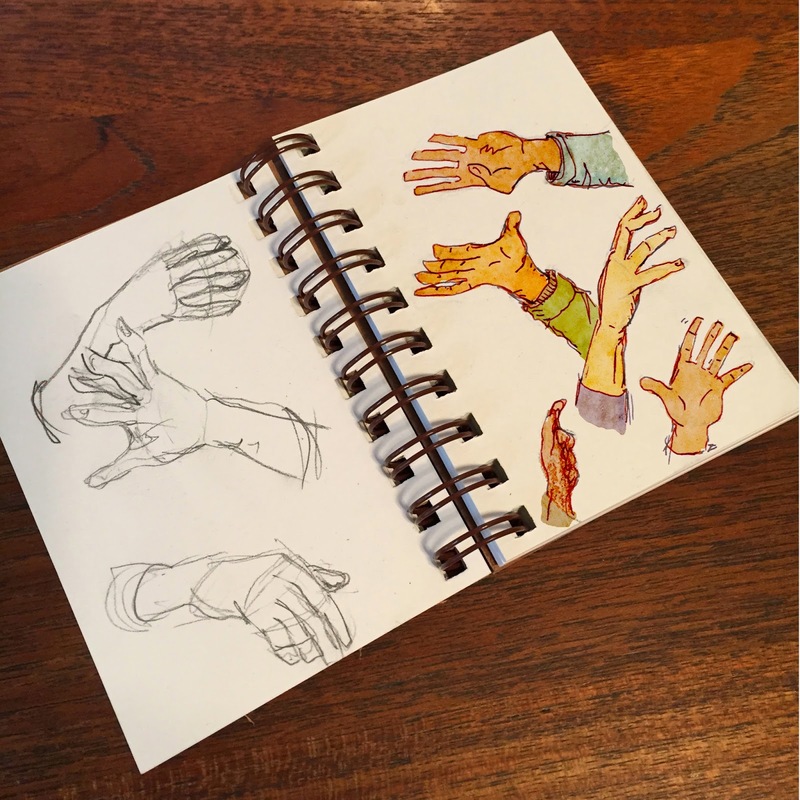 For my next 20 Hour challenge, I'm trying to get better at drawing hands. What skill would you like to learn? I've been trying to make a little something pretty every day, whether it's a doodle, a bead thing, a paper toy, a painting or a cake. 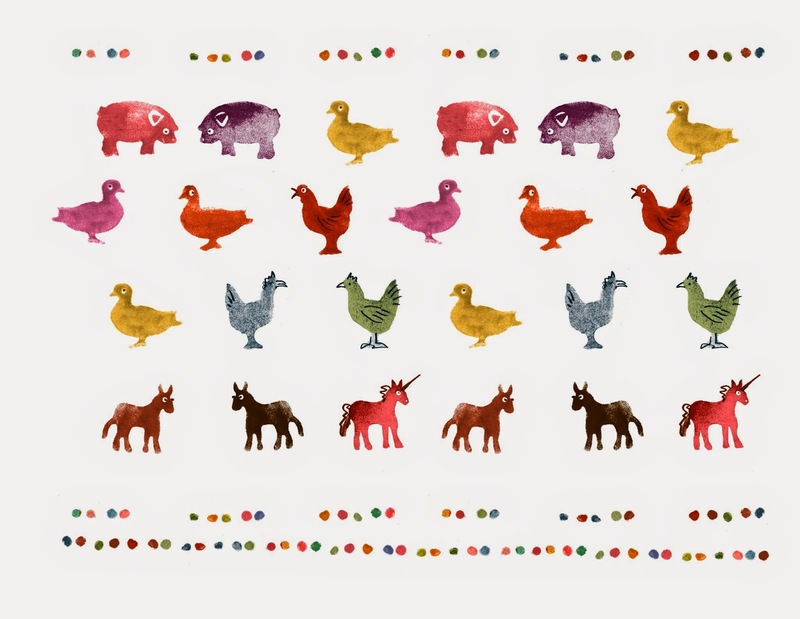 Today was this page of stampy farm animals made with tiny foam stickers I bought at the Dollar Tree. Here is a little pendant I made. I molded the bird and heart from baked clay then textured them with gold paint. I've put some of my "makings" up for sale in my etsy shop. I have peaches to make a pie but it's too hot to cook. Maybe tomorrow. 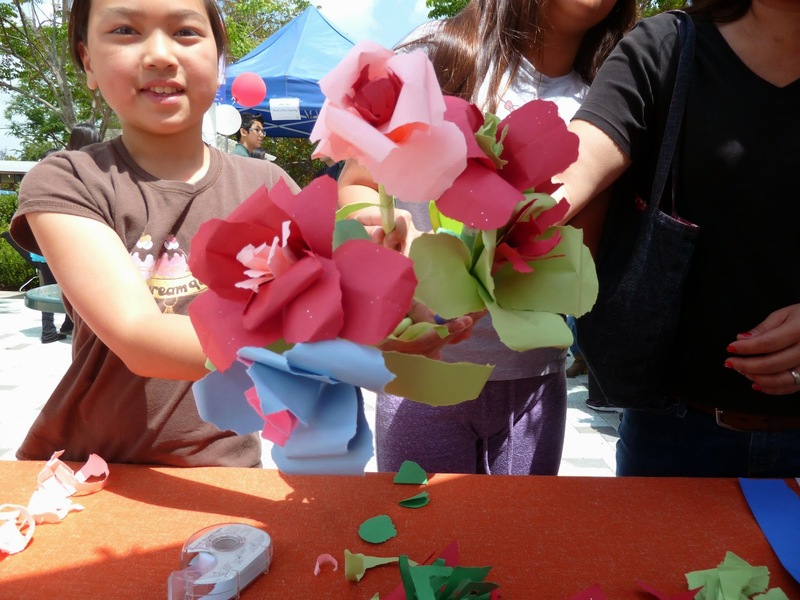 What have you been making this summer? What new things would you like to learn how to do? 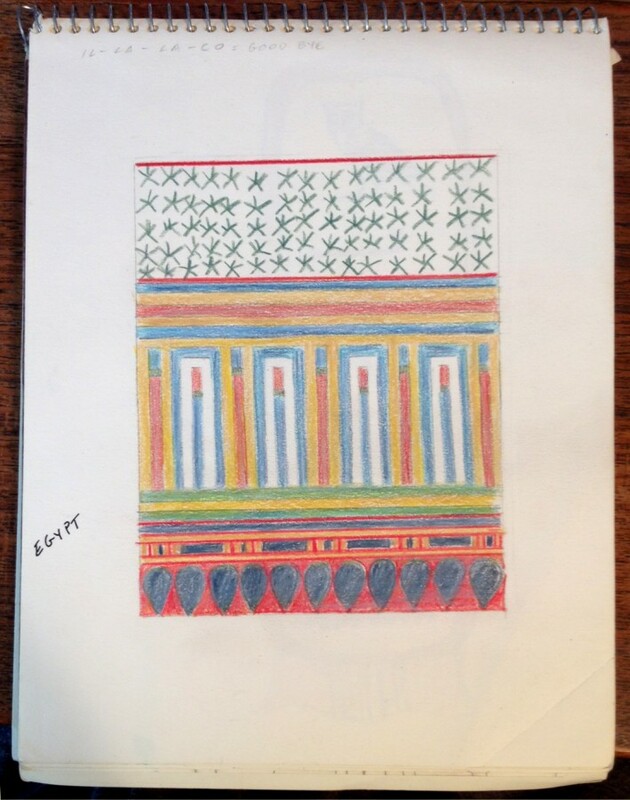 Many, many years ago I went on a trip to Egypt. It was a grand adventure, I rode a camel, saw the Valley of the Kings and toured the tomb of King Tutankhamen. I bought a beautiful alabaster bowl which sadly broke by the time I got to Greece and a little scarab made of faience that sat in a drawer, neglected. 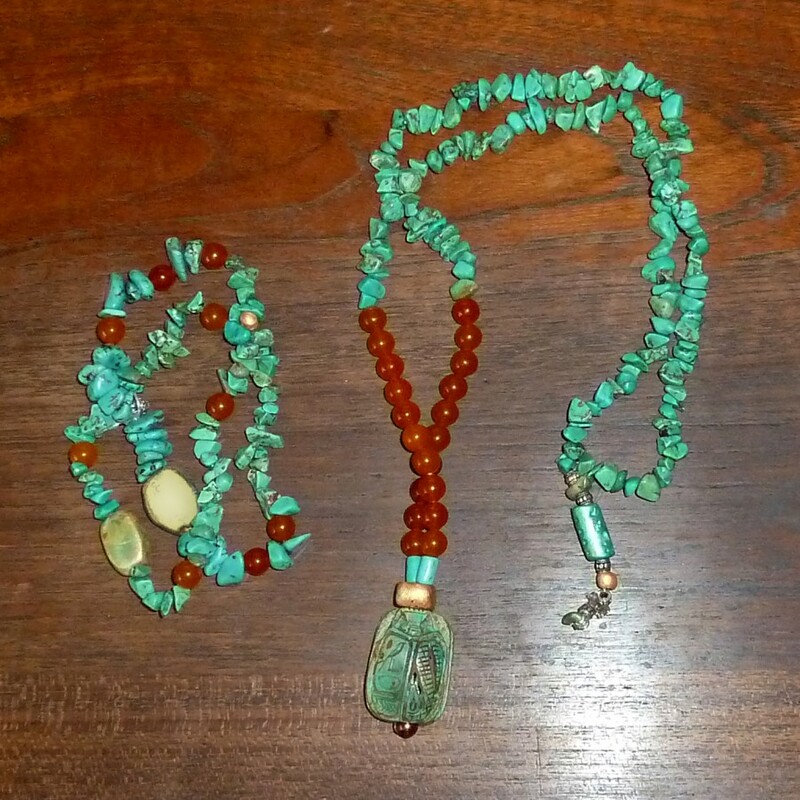 Last night I made it into a necklace with some odd beads with a bracelet to match. I haven't really thought much about that trip in years and it's all a jumble of fading memories, sounds and smells, eating watermelon, hot, dry winds, frentic taxi rides, the dusty mummy of a crocodile high on a shelf in a museum. 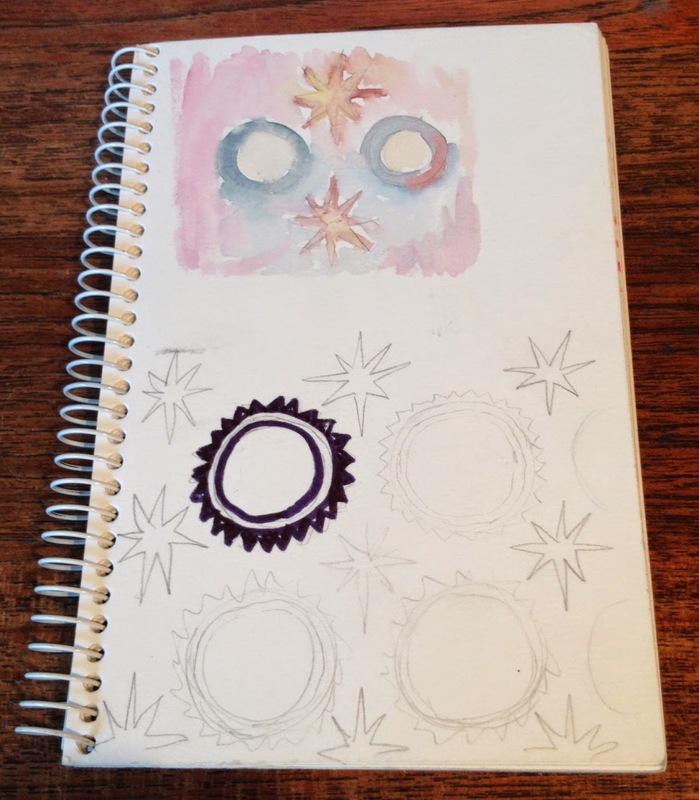 I found this little sketchbook that had a few sketches. Sometimes it's nice to remember things from a long time ago. For ever and forever when I move." 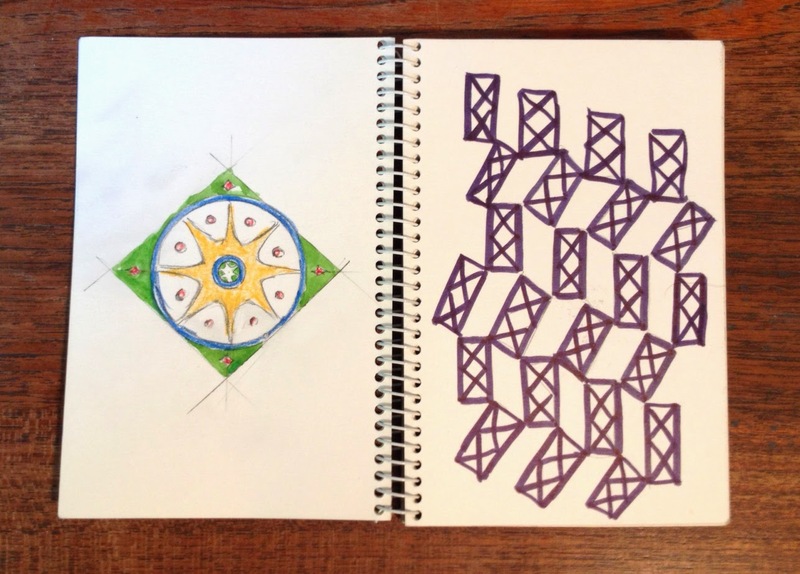 I've been going through old sketchbooks and filling the blank pages with new versions of my old drawings. 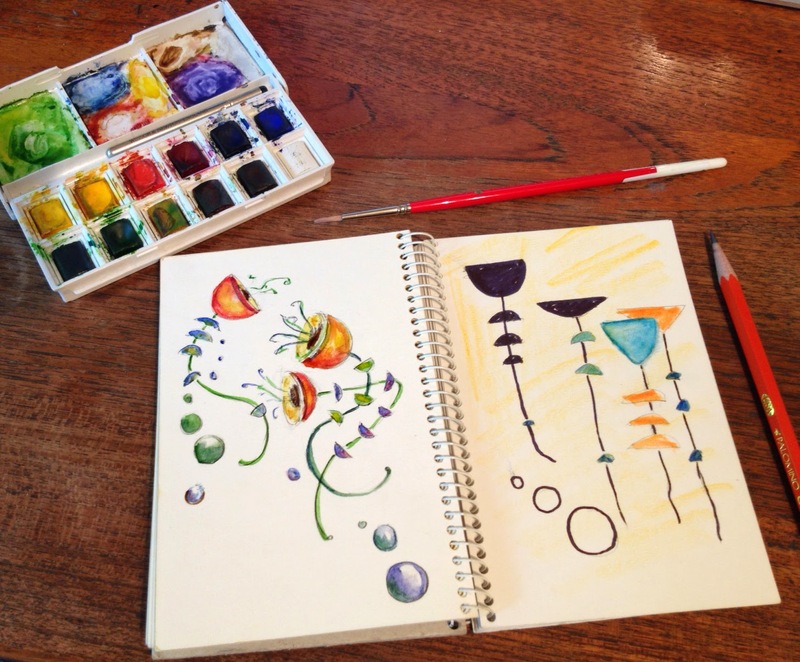 The flowers on the right were from a beautiful day I spent sketching textiles in the Victoria and Albert Museum in London a very long time ago. The new doodle is on the left. 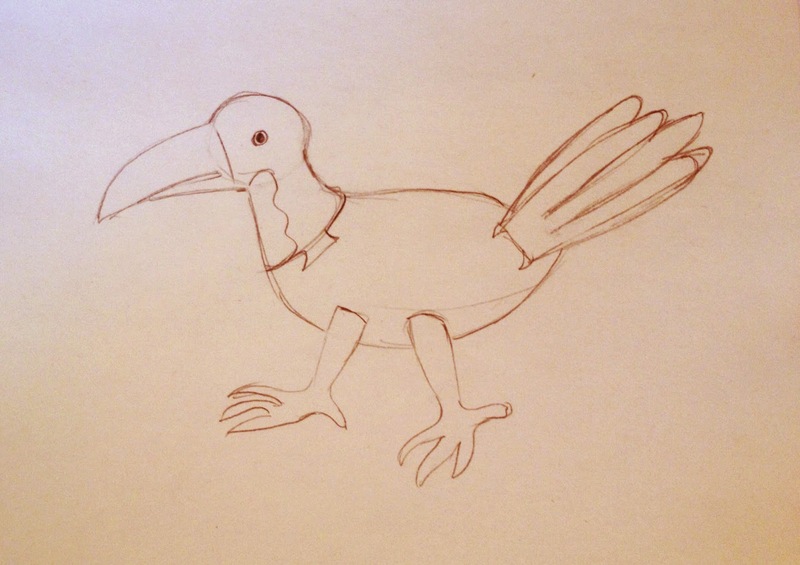 I found this funny bird toy idea that I think is supposed to have articulated parts, where when you pull on the tail the head and feet move... What was I thinking? Note to past self, make notes about the back of the design. I like the soft colors on this page. Rather dreamlike, don't you think? I would love to go back to London just to fill sketchbooks with little lines. If you could go on a drawing tour anywhere in the world where would tickle your fancy? 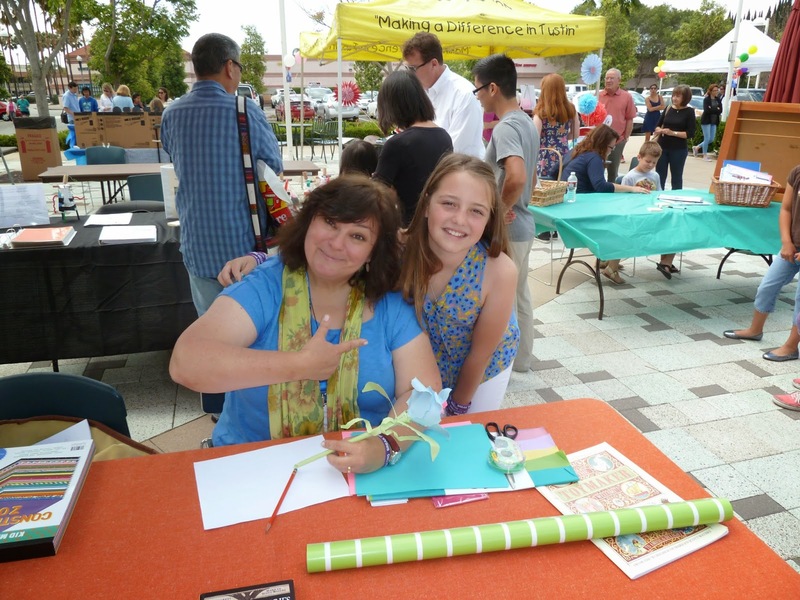 I had a superfun time yesterday at the Young Author Fair, sitting under an umbrella at the Tustin Library making toys and paper flowers with kids. The one thing I learned was that it is so important for parents to let their kids play with art. 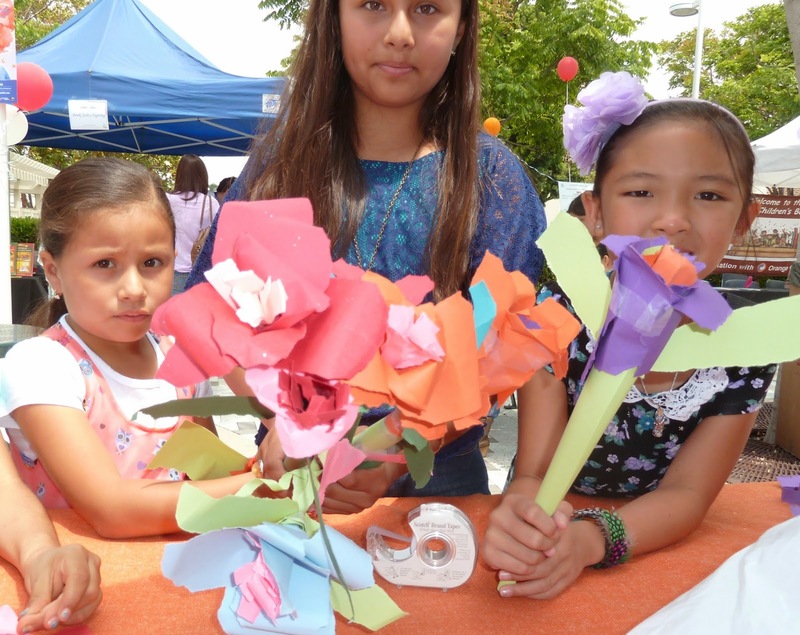 We made flowers using two pieces of construction paper and tape, no scissors needed. So pretty, don't you think? When the kids started to stress that "It wasn't right." I told them that flowers aren't made in a factory. They grow in a all sizes and kinds. This brave young lady had written a book on bullying. There were lots of other young authors reading their work. It was a great day! 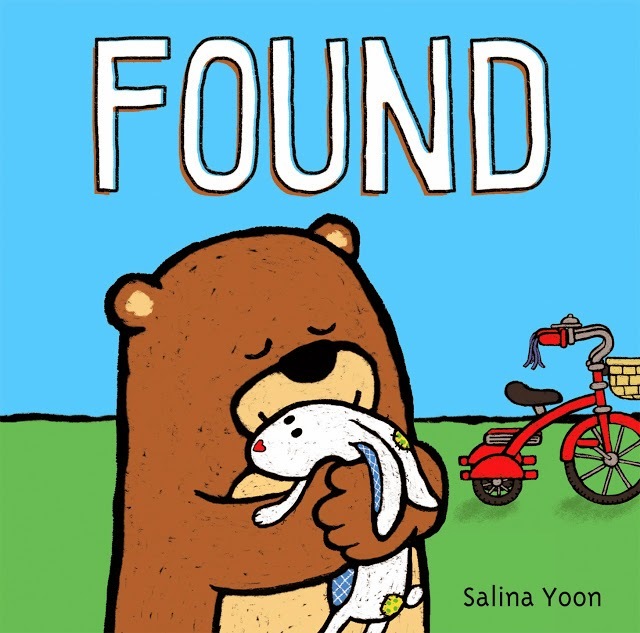 I also got a peek at her new picture book, "Found". It is a winner! I also got to meet the adorable Sheri Fink and read her books. Her positive energy and enthusiasm is contagious. This is my fourth little painting. It's a redo of the one below. I wasn't happy with the original composition so I gave it another go. Last Sunday I painted this. It was Easter Sunday Afternoon and all the parks were packed with picnickers. I finally found a spot to set up and got to work. I'm getting more comfortable with setting up my portable easel, also called a pochade, with all it's knobs and leavers. I bought a palette knife and want to get better at mixing color. It's like I can see the shade I want in my head but I haven't figured out how to make it yet. Time to pull out one of my old color theory books. 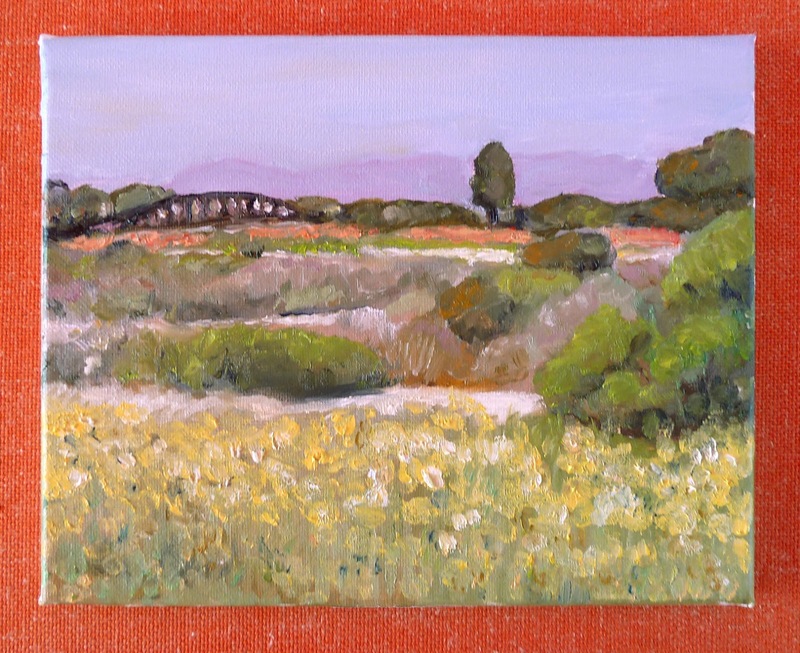 Next stop, a beach painting, or perhaps the back bay. 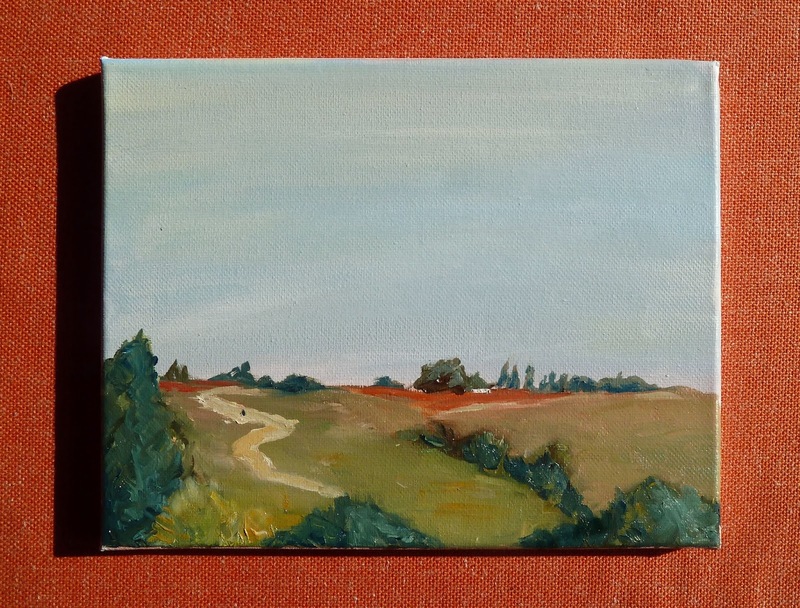 I have six little canvases left. Happy Weekend! What's on your plate? We are all about the manias here at Casa Del Aguas. It's good to try new things. Sometimes we get sucked in before we know it. 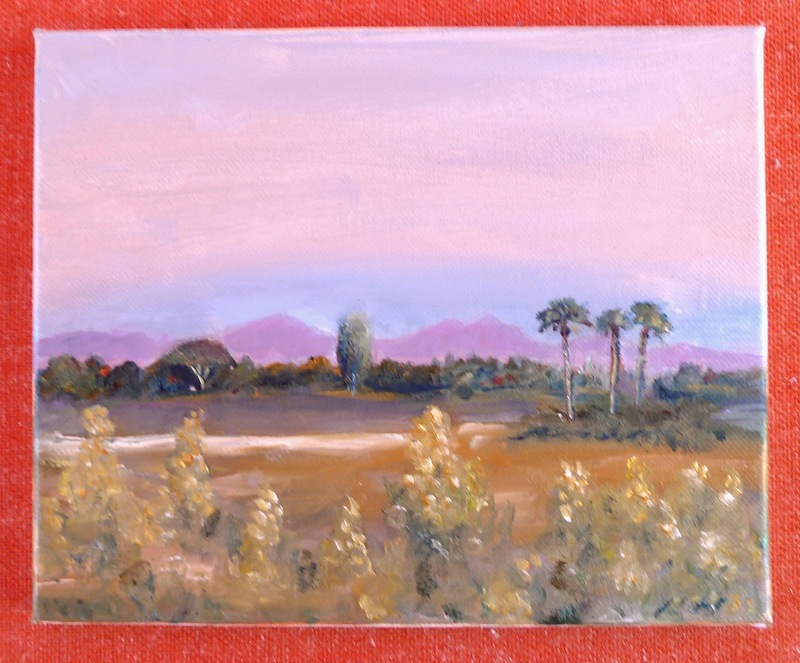 My plein air painting mania started a week ago when I went to Michael's with my mom. I picked up a box of oil paints. It was only five bucks. I wondered what it would be like to be one of those artists that goes out to beautiful places and paints nature. Outside. In the Big, Blue Room. 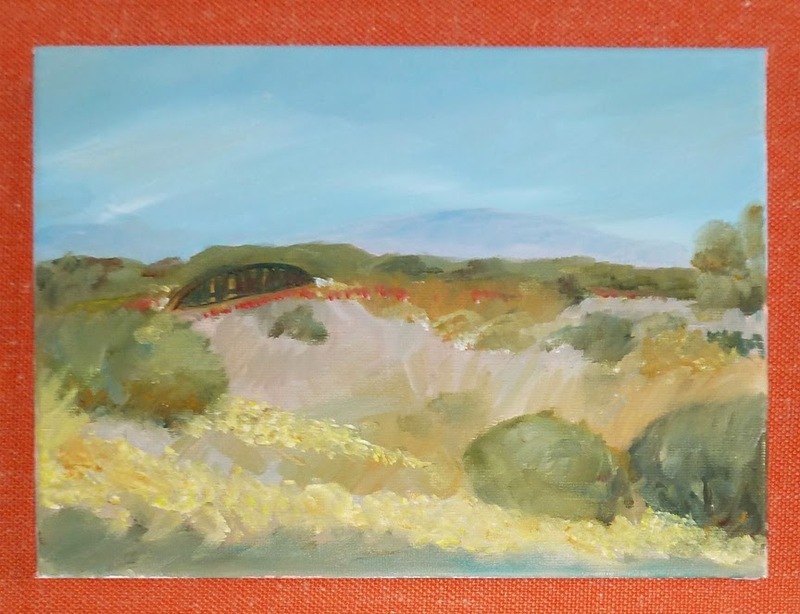 It's been a long time since I've worked with oils and painting outside seemed like a challenge. Somehow the box found its way into the cart, as well as a pack of cheap canvases. Ten canvases, that's a lot of little paintings. My friend Bob had mentioned at our last studio group meeting that he had a portable easel that he didn't use anymore. 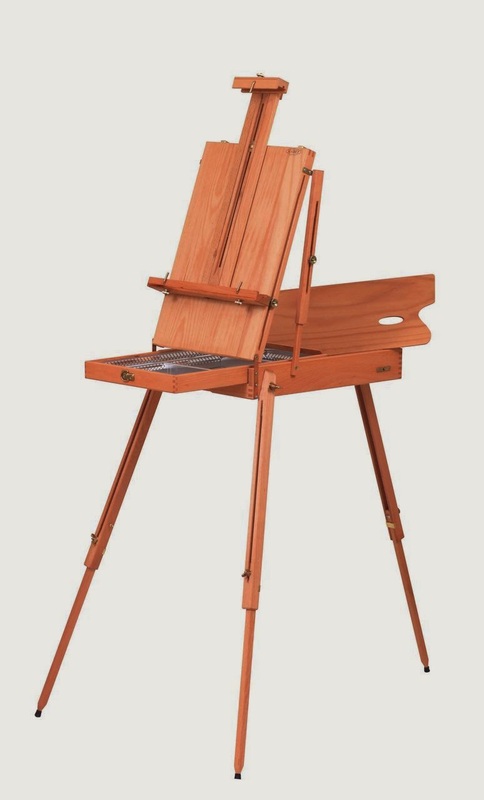 (He prefers to draw with a board on his lap) He sold me this gorgeous beechwood easel for $35. It collapses into a compact suitcase. The brass knobs are very steampunk and I had to practice setting it up and taking it down for an hour before I was comfortable with it. It was great fun outfitting the easel with paper towels, paints, some brushes and a pair of scissors. The inside is like a Japanese bento box, with nice, little compartments to keep everything tidy. I dug out my old brush wash container and filled it with turpentine. My palettes were all gunky so I used a paper plate instead. After procrastinating for a whole morning, I finally got out the door. What if it didn't turn out? What if the painting was awful? What if the colors didn't go right? What if a million things? My adventure didn't start out well. The park where I'd planned to go was packed. Some big event was going on and every parking place was taken. I drove around for a half an hour before driving to another mesa. Once I finally got set up the time flew by. There are a few bits that need tweaking but all in all I'm not disappointed with it. I need to work on a lot of techniques, composition, foreground, middle and distance. Still, it was a delight to try something new and I can't wait to get out and try again.